We were thinking that your central vacuum power unit should fit your needs be innovative, efficient and quiet by design. Superior performance with cleaner air built in. Made of solid metal construction guaranteed for life, the Electrolux Metal quiet clean line is strong and sturdy, yet elegant. 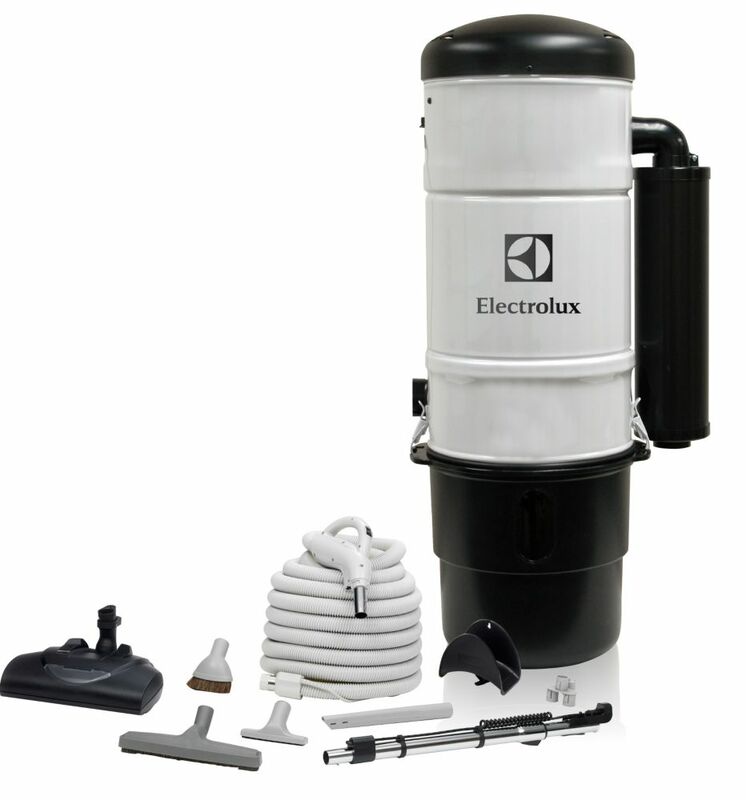 Includes Complete Electrolux Premium Carpet & Hard floor Cleaning Kit. Designed for semi & detached homes / carpeted & hard floor surfaces. Cleaning Kit. Electrolux central vacuum systems have been designed to fulfil the need for technically advanced products offering sleek design and highly effective performance. It is the built-in home cleaning solution giving you a easier, more enjoyable cleaning experience with the benefits of a healthier home. Solid Steel body construction, Positive spring latch system. Pet hair and messes are no problem with the POWERSERIES&trade; PRO Cordless 2in1 Pet Vacuum. Anti-tangle rubber bristles lift hair out of carpet and furniture to help you keep fur at a minimum. Detach the portable canister for complete floor-to-ceiling cleaning, and empty less often with the dust compactor. This vacuum automatically adjusts suction for floor type, shows battery charge status, and alerts you when it&rsquo;s time to clean the filter. Use touchscreen controls to manually adjust settings. The DEEBOT M88 robotic vacuum with an advanced wet/dry mop system has a ruthless focus on dirt, dried liquid, and grime. The unique Single Room setting allows you to focus your M88 on the hardest working parts of your house, and with Smart Cleaning Path technology, the M88 can even simulate human cleaning patterns by following an advanced back-and-forth cleaning pattern for a more thorough and systematic clean. The DEEBOT M88 also comes with ECOVACS' signature interchangeable suction options to allow you to choose the suction option best suited for your needs, multiple cleaning mode options, ECOVACS app and Amazon Alexa compatibility, and more enabling you to customize your M88 to your unique cleaning needs. Get professional results with a lightweight, compact, easy to manoeuvre vacuum that is designed for your home. The Hoover Air Pro Bagless Upright is your answer to whole-home cleaning. And it comes with a number of convenient features, making cleaning any room a snap. Designed with exclusive WindTunnel 3 Technology, that lifts and removes deep down embedded dirt with 3 channels of suction. The steerable design allows you to swivel and turn around objects with a flick of the wrist and the body reclines all the way to the floor to reach under furniture easily. The Hoover Air Pro has a telescopic handle for various height settings and a built-in wand that detaches with one simple touch. A 15 foot hose allows you to reach high ceilings and cover large areas without having to reposition the vacuum. The electronic multi-floor brush roll on/off option allows you to easily move from carpet to hard floors with a touch of a button. ELX600 w/ Carpet Cleaning Set We were thinking that your central vacuum power unit should fit your needs be innovative, efficient and quiet by design. Superior performance with cleaner air built in. Made of solid metal construction guaranteed for life, the Electrolux Metal quiet clean line is strong and sturdy, yet elegant. Includes Complete Electrolux Premium Carpet & Hard floor Cleaning Kit. Designed for semi & detached homes / carpeted & hard floor surfaces. Cleaning Kit. Electrolux central vacuum systems have been designed to fulfil the need for technically advanced products offering sleek design and highly effective performance. It is the built-in home cleaning solution giving you a easier, more enjoyable cleaning experience with the benefits of a healthier home. ELX600 w/ Carpet Cleaning Set is rated 5.0 out of 5 by 1. Does the hose on the vacuum swivel? Does this product require a vent on the outside of the house? No you do not need a vent outside of your house. It is best to install this unit in the garage or basement. The product has a muffler to dampen the sound and the exhaust comes through that muffler. There should have been a contact number in the owner/installation manual provided with the unit at the time of purchase. What is the size of the motor - 4.7&quot; or 5.7&quot;? Is it a tangential bypass motor?